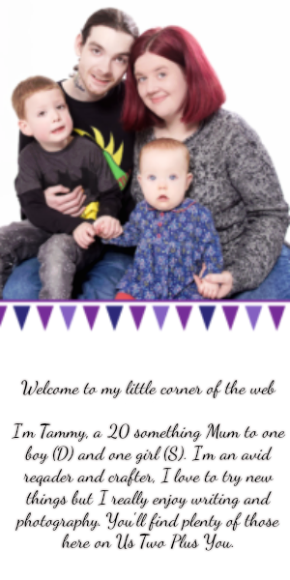 Hey guys, I have been busy tonight making something for D. It is much easier to make things for younger children as I am only really starting out with a sewing machine but I have hand sewn many things before. Sewing with a machine is very different altogether! 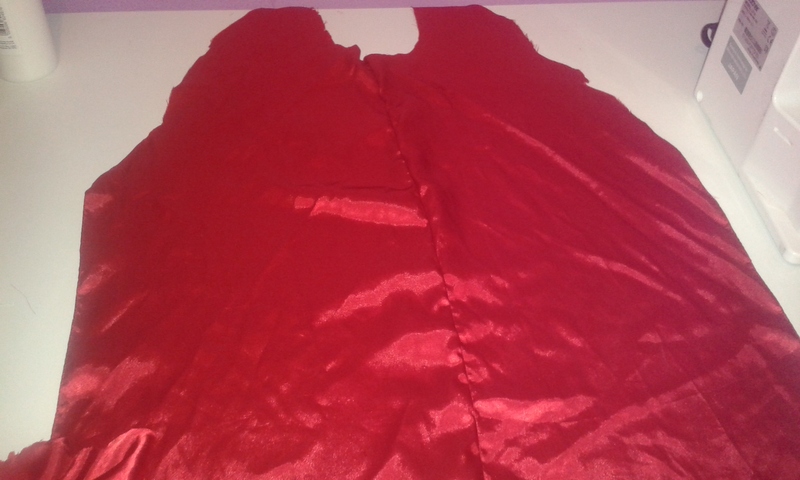 Tonight I spent around 2 hours making D a superhero cape! I think this is pretty awesome (If I do say so myself.) I have seen these everywhere on Facebook pages of people who make and sell these. 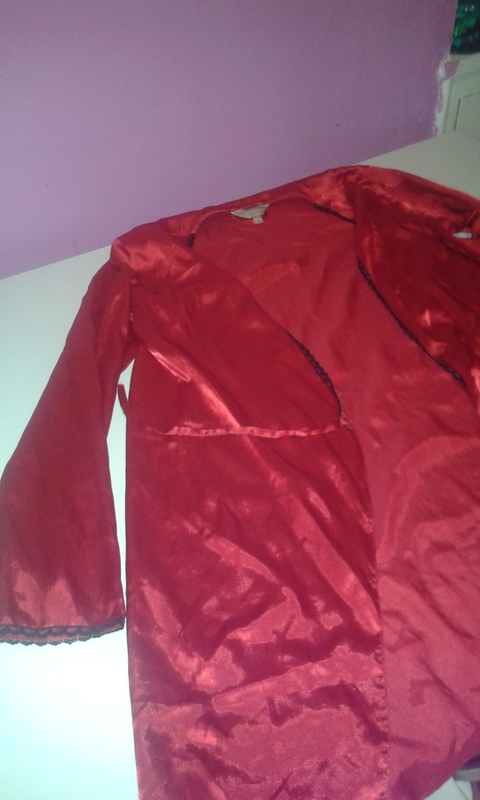 I recently found an old polyester house coat that hasn't fitted me since I got pregnant with D and thought " What is the use in this sitting around? ", so I decided I would make a superhero cape with it as the material is in great condition and I really didn't wear it all that often! I thought you guys might like to know how to make it so I am going to do a bit of a tutorial with this one. 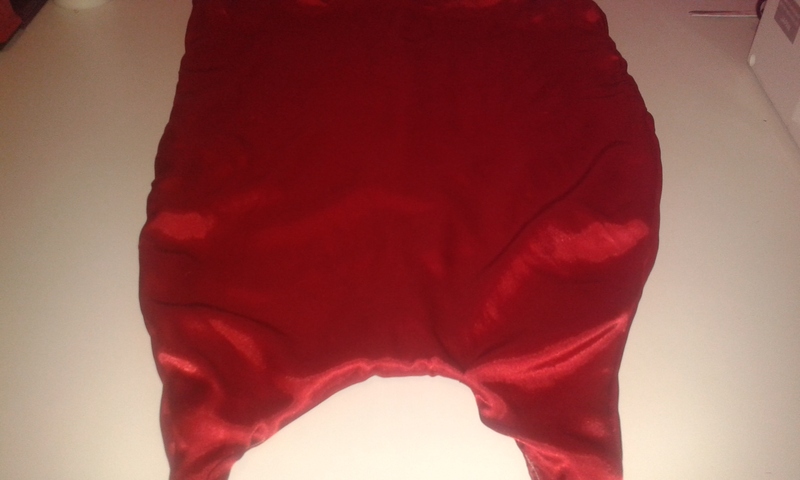 The starting house coat is a size 12 -14 and is a red polyester. 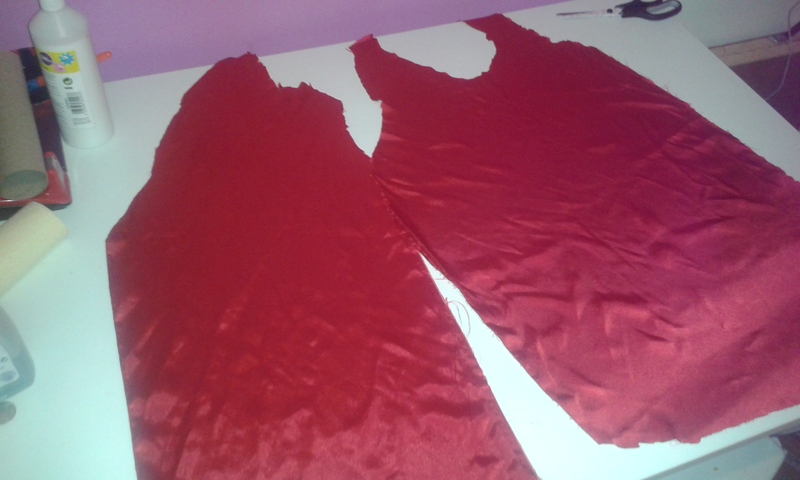 I started by cutting out a general shape of a cape with a neck piece (Please excuse my bad cutting!) I didn't have enough material to make 2 whole pieces for the front or the back so I made 1 whole piece which will be the front and two just over half pieces which will be the back. I simply cut the fabric off the house coat with as much as I could get without getting the seams. I then used some pins to pin the two back pieces together. 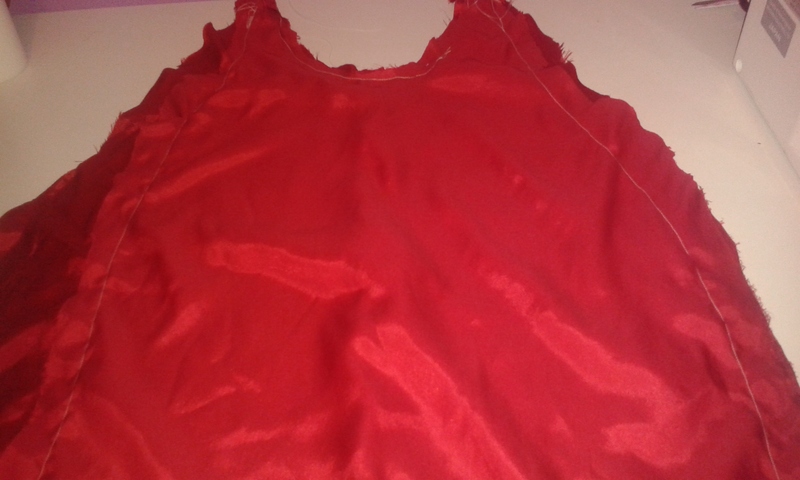 I did this on top of the front piece so I could cut the neckline to match as best I could. Being careful not to catch the bottom layer when doing the pins. 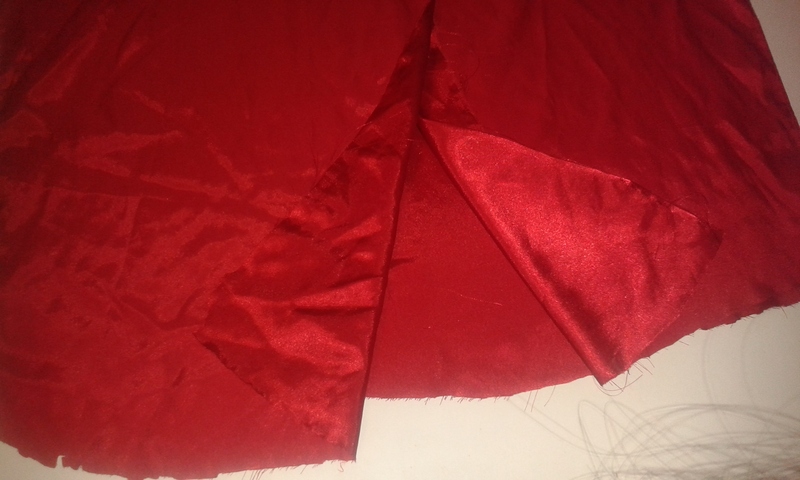 If you are making this you will also need to ensure you have the front of the fabric touching each other or this stitching and extra fabric will be visible on the cape when you are finished. Once I had all the pins in place I got the fabric (front of fabric touching again with the two back pieces) and stitched along where the pins are taking the pins out as I went along. 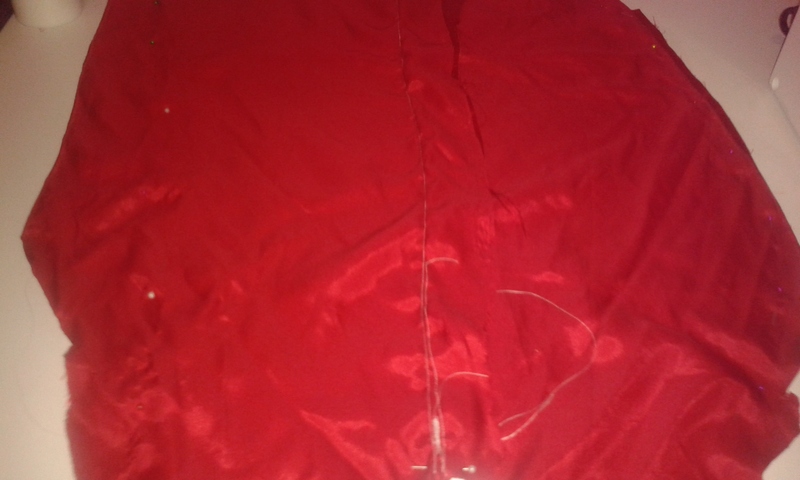 Once turned around to the front of the fabric the join looks like this. Now it was time to attach the front and back together. I got the two fabric pieces and put them together (again front sides touching) And added all my pins in. I find it much easier when all the pins face the same way. Those little white dots are the pins. 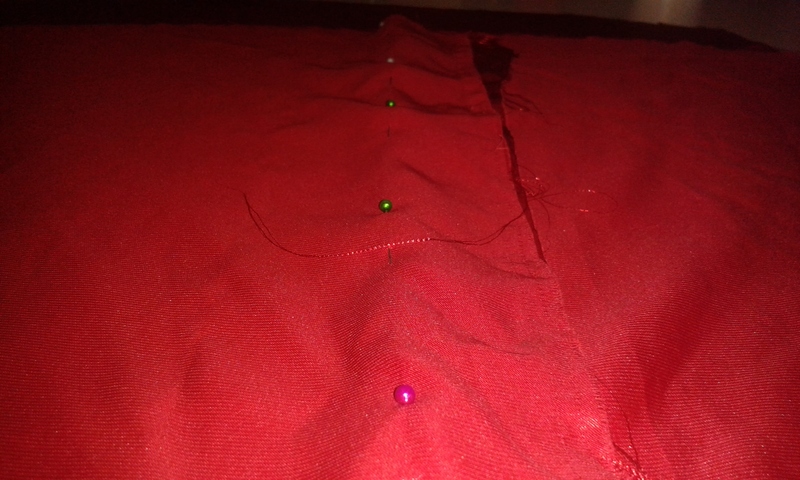 Once I got all the pins in place I got stitching using the inside line of the pins as my guide. I left a hand sized gap along the neckline. This is so I could get my hand inside to pull the fabric out so it is the right way around. 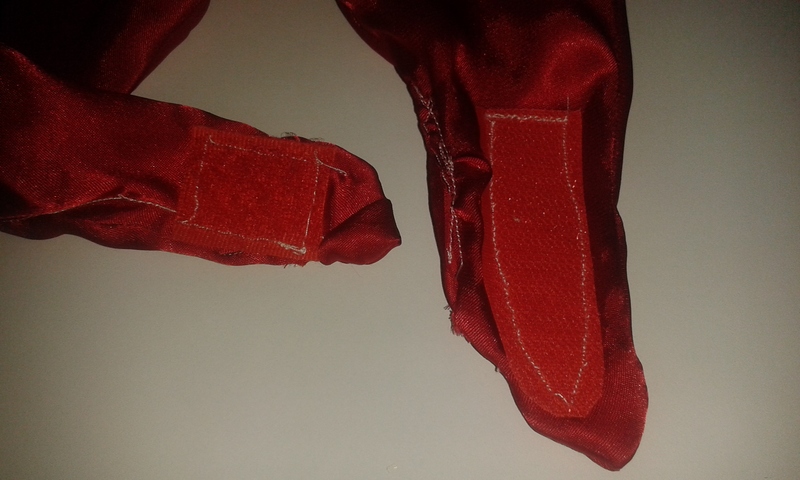 I then pulled all the fabric through the hole and stitched up the top hole by pushing the extra fabric back through the hole and stitching a small line along the hole. Once turned around the right way it looked like this. This is where using recycled material ended as I had to add some Velcro onto the two ends around the neck so D can wear it. If you are doing this you can also add en emblem to the cape. I will be adding one on later as I don't have any other colours in the material. 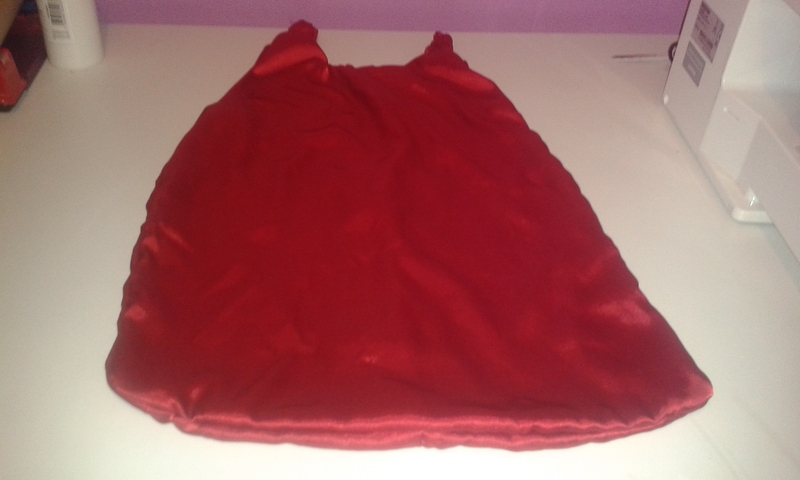 Now D has 1 superhero cape lovingly made by me to dress up with! This was super easy and didn't take much time at all to complete! This whole cape has cost me about 6p and an old house coat. Our Velcro came from some cable ties I bought to sort out all Daddies cables at his desk and came in a pack of 25. I used one and the pack cost around £1.50 ( I don't remember the exact price). You can't really beat that can you? Let me know if you like the tutorial so I can do one again, I have a few dressing up idea's in mind you can make from your own old clothing or things you can buy pretty cheap in shops! Is there something you would like me to try making? It is so easy too! You could do it by hand, it would just take a bit longer. D put it straight on this morning when he seen it!